We’ll hear all the same stuff for the length of this Eastern Conference finals series between the Bulls and Miami Heat which is now tied 1-1 with Miami’s 85-75 victory on Tuesday. It’s about rebounding and second chance points and hustle and effort and energy and, dare I say, focus, intensity and momentum. But for the Bulls, as it has been all season, it’s about Derrick Rose. He’s the MVP and with all the wonderful other stuff the Bulls do, their endlessly rotating and helping defense, it’s about Rose and whether he can get just a bit more help. In the big Game 1 victory, Luol Deng came up with 21 points and Carlos Boozer added 14. But on Tuesday, Miami held Deng to 13, but just four after the first quarter, and no one else scored in double figures. Rose finished with a team high 21 points and eight assists, but the Heat’s defense channeled him into help at the rim and the Bulls failed to find anyone else to make a difference. No one is blaming Rose as without him the Bulls might be debating whether to take Kyrie Irving. But the philosophy remains the same for opponents: Stop Rose and see if the other guys can beat us. No great strategy. The Pacers and Hawks tried unsuccessfully. Some 29 other teams tried all season. Rose is that good and his teammates have been that good as well. But Miami is a step up in competition, even if they didn’t look like it in Game 1. They were one/two in defense with the Bulls most of the season, and this time when it came down to the denouement, they were the ones to pitch the basketball shutout, holding the Bulls to one hotly contested Taj Gibson basket in the last seven minutes. With LeBron James taking over with a step back three to break a 73-73 tie with 4:28 left and combining with Dwyane Wade to outscore the Bulls 12-2 in the last 4:28, the Heat went back to Miami with home court advantage and an indication of what is to come the rest of the way. 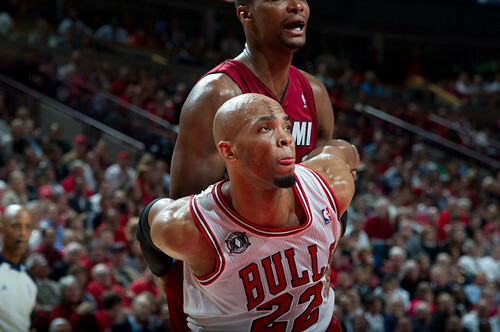 It’s going to be a grueling, withering battle of attrition after the Bulls got the Heat’s attention in Game 1. “That fourth quarter is probably what’s going to epitomize this entire series,” said Heat coach Erik Spoelstra. “It’s an absolute street fight for both teams. It’s physical basketball. Defensive‑oriented teams. I don’t know if the basketball aficionado likes a 14‑10 score in the fourth quarter (the Bulls playoff franchise low for a quarter). But that’s probably what it’s going to come down to and what it will take often in these games. 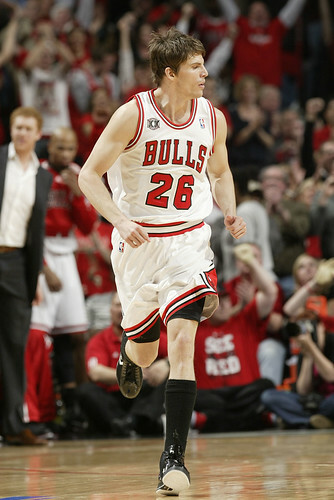 In a sense, this Heat team is more like the Bulls championship teams of the 90’s, if less talented. But it was the defense of Michael Jordan and Scottie Pippen, two brilliant athletes who could close so fast you couldn’t get a shot off, that defined the team despite their offensive glamour. Same with Miami. 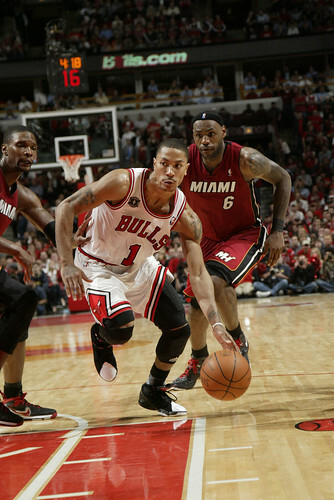 James, who defended Rose the last three minutes, and Wade, make it difficult with quickness. And while the Heat isn’t a big team, especially as they keep Zydrunas Ilgauskas and Erick Dampier inactive, with James they can be long. So they make Rose shoot higher into bodies, and it’s much more difficult with the pressure they apply. Which left the Bulls again with a question that has quietly haunted them all season: Who are they? Are they a defensive team just committed to silencing opponents? It’s difficult to remain that exclusively with an offensive force like Rose. Or are they an offensive team as they finish games with their offensive players on the floor, Tuesday with Kyle Korver, though Carlos Boozer remained out with Gibson scoring eight of the team’s 10 fourth quarter points. But Miami constantly went at Korver in a so called one/three pick and roll, trying to force Korver to switch onto James. Deng tried to avoid the switch, but ended up going under James, as James got off one of those big jumpers that way and another with a switch to Rose. Deng lost the angle on a James drive for a score as he turned the corner for a virtually clinching basket on a putback after his own driving miss with 1:31 left for an 82-72 Miami lead. Perhaps the big X-factor, though, was Udonis Haslem, who had been out virtually since November with foot surgery and just back for a few minutes since and scoreless in seven playoff minutes so far. But he is Miami’s Gibson, the bench energizer, and he was crucial with 13 points and five rebounds off the bench and the hustle and production the Heat had missed. Thanks to Haslem and the Heat perimeter players, Wade and James, getting on the boards, Miami reversed the Game 1 Bulls edge by outrebounding the Bulls 45-41. 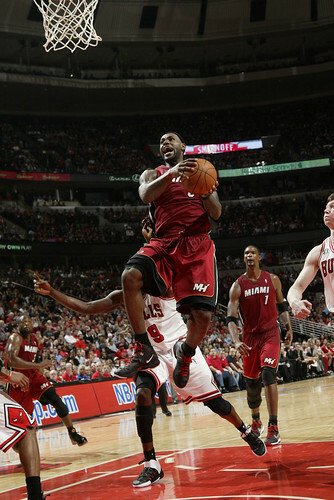 “You look at how LeBron rebounded, 10 rebounds, Wade nine rebounds, Mike Miller seven rebounds in short minutes, Haslem. 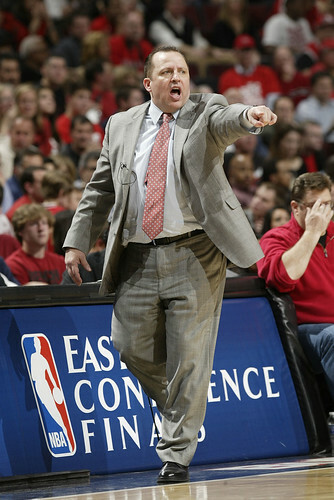 When the ball was up on the board, they were in the fight,” said Bulls coach Tom Thibodeau. The Bulls still led 18-12 in second chance points and 17-10 on offensive rebounds. So it was hardly like the Bulls were outworked. Their defense was acceptable. The Heat, after all, only scored three more points than in Game 1. But with Rose funneled into help at the rim, the ball wasn’t moving as well down the stretch and no one was making shots. Korver was one of seven and one of five on threes and Deng was one of seven on threes. Yes, some were bad luck, like Korver’s open three on a sharp out of bounds play when Joakim Noah practically tackled Mike Bibby with a screen and Korver’s three went halfway down and out. That could have brought the Bulls within 78-76 with three minutes left right before Gibson’s score. That’s how close the Bulls were to a tie heading into the last two minutes. Then could Miami have closed? They do much better when they don’t have to make those shots in the last 30 seconds. They make them with three minutes to go. Later the rim seems to shrink. Noah was wearing a sweater and stocking cap in the warm Bulls locker room. Though I took this as Thibodeau style inspiration and already trying to adjust to the Miami weather. But two questions stand out. 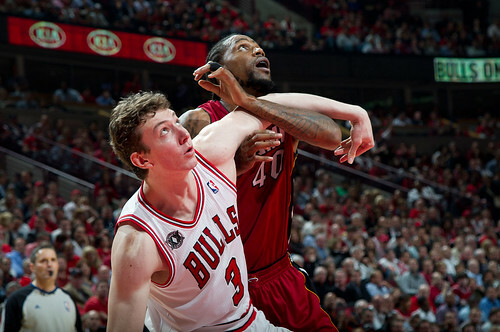 One was whether the Bulls should have played defense all the way as Omer Asik, who had zero points and two rebounds, practically dominated the game the first half of the fourth quarter. The big rookie already may be one of the best big men defenders in the NBA, though barely noticed. 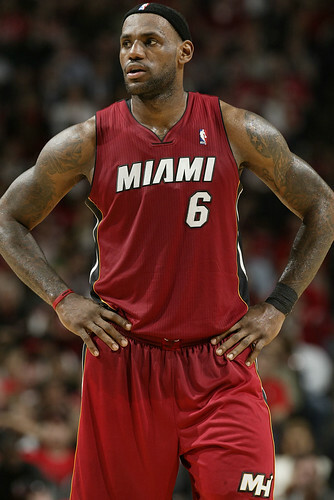 His help and closing on Miami shooters held the Heat to one basket in the first seven and a half minutes of the fourth. Among the highlights was forcing misses by Dwyane Wade and Udonis Haslem on the same possession, forcing Wade into a turnover on the next Heat possession, then closing on Haslem and forcing him into a miss and blocking a Wade drive for what seemed like a sure dunk. 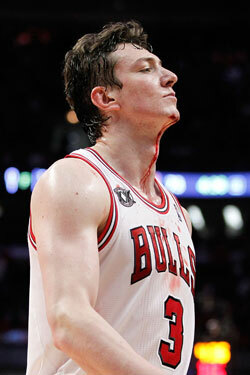 Though that collision with about six minutes left and the game tied at 73 would lead to a three stitch cut on Asik’s chin and an exit from the game. Of course, Asik also rarely gets a shot, so when he is in there with the defensive lineup with Brewer, the defense loads to Deng, Rose and Gibson and makes shots tougher. Still, it did look like Thibodeau was going to ride that defensive unit as he kept Noah out almost 12 straight minutes from four minutes left in the third until Asik was cut and had to leave the floor for stitches. By coincidence or not that’s when the Heat closed to win the game. Really, it is something of a delicate balancing act for Thibodeau as despite how well the Bulls have played this season and into the playoffs now 9-3, they are hardly a complete team. It’s almost a platoon system with very few two way players, which works better in football. Thibodeau likes to finish games with his offensive players and balance the defensive guys with scorers later in quarters. But when they are missing shots, and the Bulls shot 34.1 percent in Game 2, it leaves too many scoring opportunities for the opposition. The Bulls scored just 29 points in the second half Tuesday, and you only can match that if you stay with your defensive players. But it’s not the way the Bulls played the season, and likely it’s succeed or fail this way. Thibodeau did have Rose and Korver run some pick and roll in Game 1 to free one shooter, though not as much in Game 2. Curiously, Miami doesn’t use much pick and roll involving James and Wade, which you’d think would give them a huge edge. Though they did one with a 78-73 lead with 2:44 left in which James tried to take Deng into the post and traveled. But Miami did take advantage of Korver with Bibby in the pick and roll in the fourth quarter. Go with Brewer? He’s not making threes. Although Heat coach Spoelstra seems like a bright guy, you also sense the Bulls can remain in this series because he does do some curious things. No one seems to understand why he won’t give Ilgauskas a chance. Yes, we all know he’s not very mobile. But he’s 7-3 and can make a shot. They’re starting Joel Anthony, who was scoreless for the second straight game now in more than 53 minutes. They come in with Jamaal Magloire, who commits fouls as soon as he checks in given how slow he is. If the Heat went with Ilgauskas, Boozer would probably have to play him with Noah on Chris Bosh, who had just 10 points Tuesday after 30 in Game 1. And no matter how little mobility Ilgauskas has, he has about eight inches on Boozer and you’d think they could get lobs that way. 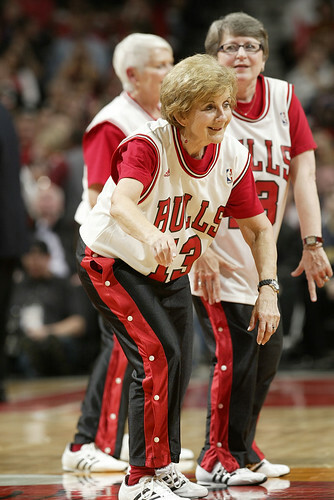 If Noah played him, the Bulls would have to move Boozer on Bosh, a bad matchup. But those poor decisions still probably saved the game for Miami as Spoelstra discovered Haslem could play. Anthony and Magloire were in foul trouble, so Spoelstra had to to go to Haslem. His energy, hustle and jump shooting seemed to energize Miami and sent them to a 48-46 halftime lead after they trailed 26-19 after the first quarter when Deng closed with a 41 foot three pointer. 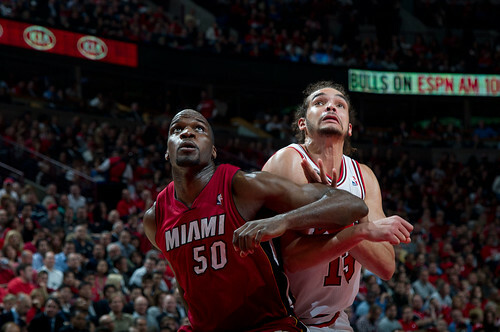 The Bulls had dominated Miami in every third quarter the teams played in the four games this season. But Tuesday it was the Heat looking like they’d break open the game with a 10-0 run (the same thing the Bulls did to break open Game 1 at the same time). In that stretch, the Heat had four straight fast break baskets, Haslem running out twice for dunks and James and Wade once each after Bulls turnovers or blocked shots. 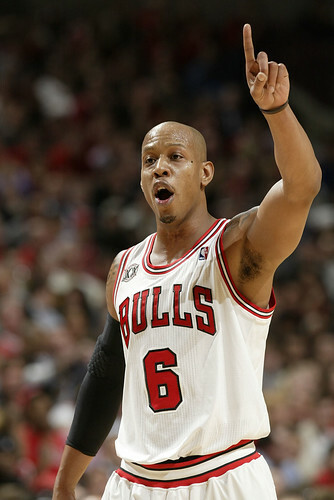 The Bulls called timeout trailing 65-56 with 3:58 left in the third. So Spoelstra curiously substituted Magloire for Wade and Mike Miller for Bosh, leaving little offense on the floor. The Bulls were then able to close the quarter with 9-4 run to get within 71-65 going into the fourth, crushing Miami’s momentum. The Bulls opened the fourth with a pair of Gibson scores on a left-handed drive after he blocked a Haslem shot and a 20 footer. 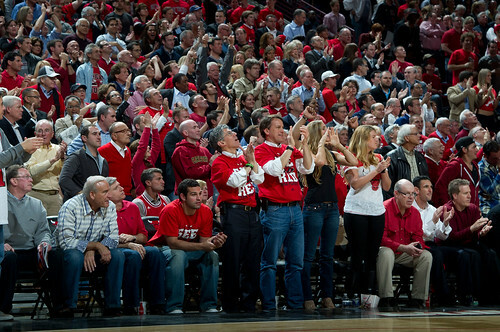 That brought the Bulls within 71-69 with just under 10 minutes remaining and the United Center rocking. 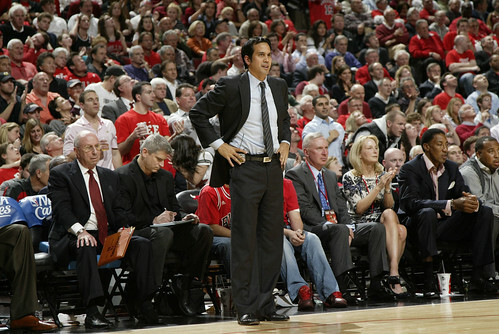 It seemed like Spoelstra had blown it. There are three off days until Game 3 Sunday in Miami. What was he saving those guys for? But Miami did pull this one out in the end. Rose did draw a pair of fouls in the first quarter, though it didn’t hurt the team as he went out with the score tied at 15 and the Bulls finished the first leading 26-19. 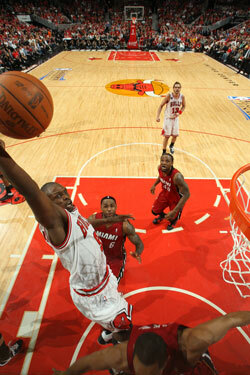 The Bulls looked awfully good after that Deng near half court three and a terrific run out dunk earlier by Deng. Boozer did a nice job sealing inside for a pair of scores and Noah led a classic fast break. It looked like the Heat was dead. 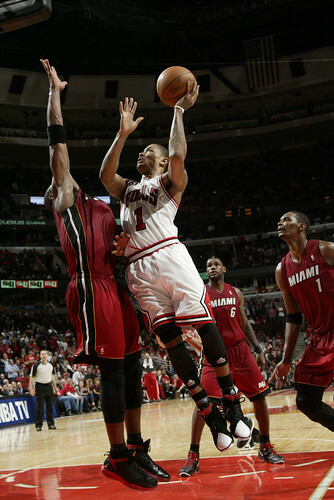 The Heat continued their pressure on Rose, blitzing every pick and roll. But it also is a sign at times for Rose when he doesn’t get going fast. You’d think the opportunity would present itself against Miami and Bibby, certainly among the league’s poorest defenders. But the Bulls don’t work much to get the ball back to Rose to attack Bibby, and it seems to put Rose in a more passive mode as he had just seven points in the first half. I know he is asked to do so much on offense for the Bulls, but his offense at the start is almost as vital as it is at the end, and perhaps easier as Miami made a point to pack and close the lane down the stretch much more so than earlier in the game. 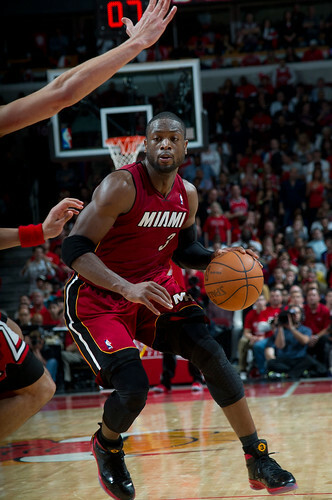 Wade got going in the second quarter with a dozen and getting to the line, which was crucial for Miami after 15 free throws in Game 1. They were 18 of 24, though hardly an unfairly called game as the Bulls had 26 free throws. They missed 10, which was fatal as they got 14 more shots this time after 19 more in Game 1. 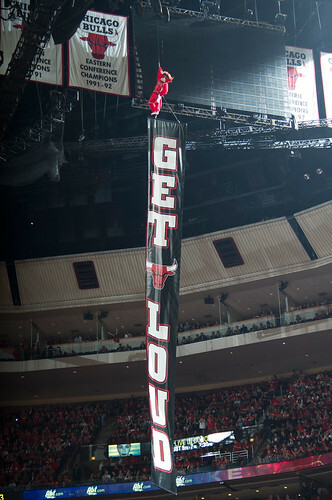 So the Bulls did hustle and did get loose balls, just not quite as many as in Game 1. But they were challenged more and could not find their offense as a result. Miami took that halftime lead and seemed like they might blow it open with that third quarter run as they pressured the Bulls and played the passing lanes for steals. Then Asik, Brewer and Gibson were all over the court to open the fourth, not giving any Heat shooter a clean look as Miami missed seven of its first eight shots with three turnovers. But the Bulls could scratch out just eight points in that seven and a half minute stretch before James’ three gave the Heat the lead to stay. Deng actually got blocked by Bibby — I know, I apologize for all those terrible things I wrote about his defense — on a drive when he failed to bring the ball up quickly enough, and James followed with a 13 footer getting Rose on a switch as he ran that pick and roll with Wade again to give Miami a 78-73 lead with 3:15 left. Korver then spun that three in and out and James traveled on that postup. Gibson them forced in a drive and was fouled, but missed the free throw. The Bulls trailed by three with 2:29 left. Wade then drove and was fouled by Noah on a reach in and made both and James tripped Deng on a drive for a turnover. James then followed with that drive and put back and after Wade blocked a Rose 22 footer, James closed it with a 20 footer with 47 seconds left for an 84-75 Miami lead. James danced off and did his bumping thing, though he and Wade have become such divas it gets more difficult to take them seriously. Once in the conference finals, the NBA takes over the media responsibilities and asks the top players and coaches win or lose to speak at a podium because the press contingent has gotten so large. Rose has done so win or lose. Understandably, Wade and James were upset after Game 1 and declined. OK. But Tuesday after Game 2, they declined again and did brief interviews while sitting in their locker stalls. Of course, it made it a humiliating experience for media pushing and straining to hear amidst a big circle of reporters. No one in the media much complained. Everyone gets to see great games for free and this is a part of the job. But you also get a sense of what kind of people James and Wade are knowing they could make it easier on everyone and even avoid the crowd in the locker room that bothers their teammates. No, it’s not a big thing and others have done it, though most of the big stars of the game don’t. They generally understand their responsibilities to the NBA and the game, that the game is bigger than everyone. But maybe some don’t see it that way.